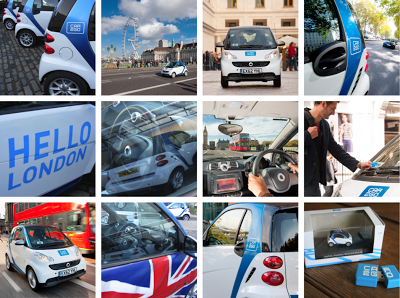 After successful outings in mainland Europe and the US, London has just become the 17th city to be served by car2go. Yesterday I went along to Boxpark next to Shoreditch station to the launch of this brilliant carsharing service. They call it 'the future of urban mobility' and I agree; I think it's brilliant. It's a much simpler system than other carsharing schemes available at the moment – with car2go you register as a user (see below) and to get your card which will then activate any available car you see on the street or locate using the smartphone app. You can then drive the car around as necessary and just leave it parked anywhere legal within a car2go zone/borough. There are only three boroughs in London at the moment but I am sure that very quickly these little blue and white cars will be as common as the Boris bikes. The environmentally friendly hybrid cars save on costs by switching themselves off when the car is at a standstill at traffic lights etc, and are therefore economical to hire. Prices start from 35p a minute up to £59 for a whole day and this includes fuel, insurance, tax, parking and the Congestion Zone charge. I can see lots of opportunities for my own personal use, such as when I get off the Gatwick Express late at night after the tubes have finished and a black cab home to Holloway costs almost £30. How nice it would be to just sling my bag in the back of one of these little darlings and drive myself home for less than half the price! See the website for even more information. A selection of images; some are mine, and some were supplied on a cute little promo USB stick along with an even tinier toy Smartcar in a box. Nice touch. I think it's one of those good ideas that really need a larger exposure and support base. Maybe with additional help, they can sport the use of larger vehicles for more people to use. I wish they had projects like that here too. It'll be a great deal of help for more people if those vehicles can be made available to the wider american public. The toy car looks similar to the real one. I guess that people will really enjoy riding this car because they can save a lot of money. Looks like a nice carpooling system here. It's very efficient on energy and maintenance too. This is a good project indeed, and I agree with what Whitney and Cortez said, the dealers of this car should expand their business to other parts of the world. To make it more useful, I may have to suggest that they should also add more accessories to this car like for example GPS navigation and radar detector equipment, I think in that way they can further improve it if this car is fully equipped with these security equipment. I've heard a lot of good things about this program. It's the culmination of efficiency with economy and environmental safety. I guess it helps that it has a lot of complimentary electronic devices that help it stay agile without leaving some pollution. This was a wonderful add-on to the city scene. The fact that it relies on modern electronics to reduce its carbon footprint makes it doubly awesome. I really like to drive this kind of car. I think this just limited only in london. I hope some I could buy one.